In the short time since fall has begun Linda Gross Brown has won multiple honors for her work and has been accepted into various upcoming exhibitions. "Footsteps #7" was awarded the Chicago Pastel Painters' Award of Excellence at the 2018 Chicago Pastel Painters' Exhibition, "Treehaven #1" got an Honorable Mention at the Rejoice in Art! Juried Exhibition, and "Footsteps #16" got an Honorable mention in the Pastel Guild of Europe's Open Online Competition. "Footsteps #14" was accepted into both the 90th Grand National Exhibition of the American Artists Professional League and the Catharine Lorillard Wolfe Art Club's 122nd Annual Open Exhibition. Looking back on the year, "Sunset, Gulf of Mexico #2" was shown at the 2018 Great Lakes Pastel Society National Exhibition and "Footsteps #12" was shown at the 2018 Academy Center for the Arts Annual National Juried Exhibition. "Footsteps #16" won the Light/Shadow Award at the American Artists Profesional League's Annual Exhibition. 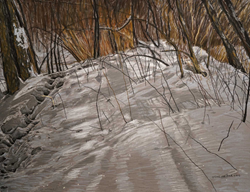 Later on in the year, "Footsteps #16" was shown at the American Artists Professional League's 2018 Celebrating the Spirit of America Show, while "Treehaven #1", "Snowtracks #1", and "Footsteps #5" were shown at Pastel en Périgord's 2018 International Pastel Show in France. Continuing the "Footesteps" series successes, "Footsteps #12" won the Cheap Joe's Art Stuff Award at the Hudson Valey Art Association's Annual Exhibition, "Footsteps #16" was shown at the Allied Artists of America's 2018 Annual Exhibition where it won the Diane B. Berhard Silver Medal Award in Pastel and was also shown at the Degas Pastel Society's 17th Biennial National Exhibition, "Footsteps #15" was a finalist in the Artist's Magazine's 35th Annual Competition, and "Footsteps #7" along with "Footsteps #10" were accepted into the Chicago Pastel painters Seventh Biennial Member Juried Exhibition. Additionally, "Treehaven #1" and "Tracks in the Sand" were shown at the Rejoice in Art! Juried Exhibition.